Less than five light years away sit three stars orbiting each other. You probably remember that one of them, Proxima Centauri, has a planet orbiting in its habitable zone—which got us really excited about the possibility of life. But what if that star was stolen? That’s a real possibility, according to new evidence from a pair of scientists from the University of Hertfordshire in the UK. They’ve just ran some simulations, but those simulations combined with some other evidence add credence to the possibility that Proxima Centauri wasn’t formed alongside the other two stars in the system, alpha Centauri A and B. And this could potentially influence the habitability of Proxima Centauri’s planet, Proxima b. 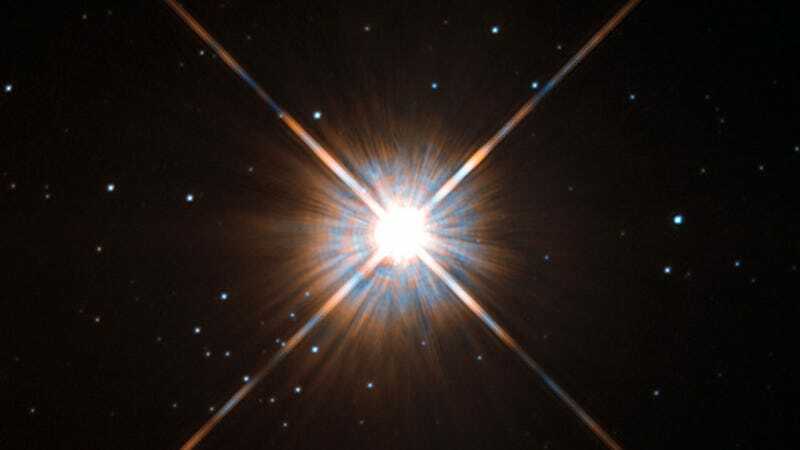 “If Proxima was captured by alpha Centauri, Proxima b may only be influenced by alpha Centauri A and B for a relatively short period of time, and thus was probably orbiting in the current habitable zone for a long time,” according to the paper published this week in the Monthly Notices of the Royal Astronomical Society. Here’s a neat thing about the laws of physics—lots of them work the same forward as they do backward. The researchers’ specific simulation takes advantage of this fact, starting with some details on Proxima’s relationship alpha Centauri and adding in the influence of other potential gravitational forces. They ran lots of simulations to account for the uncertainty in the orbits, and, well, waited to see if Proxima flew away. Play it in reverse and you get the picture—in those cases, Proxima would have been sucked up by the other alpha Centauri stars. Running the simulation from seven billion years ago to seven billion years in the future, Proxima was ejected in the past in 23 percent of the cases and will be ejected in the future in 15 percent of the cases. This demonstrated to the reserachers that there was a reasonable chance that sometime in Proxima’s past, it wasn’t part of the alpha Centauri star system. Scientists have never seen a binary star system in the midst of forming, but capture is given as one potential mechanism. Maybe it happened in this case. But wait, there’s more. Scientists have long assumed that Proxima Centauri’s metal content looked a lot like alpha Centauri A and B’s, explained Russell Dietrick, a graduate student at the University of Washington not involved in the study. Recent evidence has suggested that Proxima’s might actually be different, implying that it wasn’t formed in the same place. There’s still uncertainty as to just how different Proxima really is, he said, but maybe it’s different enough to have come from someplace else. Obviously this is just a model with its limitations. Dietrick noticed that it treats alpha Centauri A and B as one star, even though, well, they’re actually two. Others have used this simplification, but the effects of both stars could potentially complicate things. Plus, there’s just a lot scientists still don’t know about the history of the star system that might influence the way it evolved. Still, Proxima’s got an Earth-like exoplanet in its habitable zone. Any information about its past or future could have influenced the way that planet looks—and whether it contains life.